First, let’s go over what remarketing is and why it’s important to your mortgage business. Remarketing (also known as retargeting ) is one of the newer trends in targeted advertising. Businesses in every industry are recouping major amounts of money off of deflected traffic by implementing remarketing campaigns. If you’re unfamiliar with retargeting/remarketing just think back to a recent time that you did a product search on the Internet. After you searched for said product you’ll notice that a few websites ads will “follow” you around the Internet. The ads for companies websites that you’ve visited will take up prime position in Google’s display ad network and attempt to drive you back to their website. This is remarketing or retargeting hard at work. Why Does Your Mortgage Business You Need To Use Remarketing? Not all visitors to your site are going to respond to your call to action on their first visit. Chances are that if they arrive on your site and leave shortly thereafter, then they might never return, especially with high value purchases like mortgage products. Who knows what it was that made them leave, but the fact is that whether the kids coloring on the walls, or the doorbell ringing distracts them long enough to not do what you need them to do, you might never see them again. Remarketing gives you the opportunity to expose your brand to said site visitor over the course of several days, weeks, or months and coax them back to your website. There’s a good amount of quantitative data that shows remarketing is a bona-fide way to increase ROI. Which means that if your prospect was or wasn’t primed to take action on their first visit, perhaps after seeing your ad a few more times…they will give you their e-mail or credit card info. The bottom line is remarketing to them over the course of a few weeks ups your chance that they will do business with you in the future. 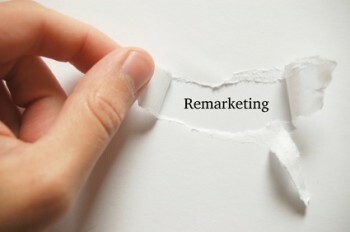 Here’s How To Set Up A Remarketing Campaign. It should be noted that there is a FREE way to remarket, and you can also pay a company to run your remarketing for you. Companies like adroll, steelhouse.com and fetchback will manage your remarketing efforts for you. But, if you’d like to begin testing for free (besides paying for the clicks of course) with remarketing efforts using Google adwords service, here is a breakdown on how to set up a remarketing campaign. 1. Identify your audience – Before you can set up a campaign, you need to figure out to whom you will be advertising. Audience can be broken up into a different groups based on their activity on your website. You can break them up by visitors who viewed a page that offers a specific product or service…added a product to their shopping cart and did not complete the purchase…signed your contact form and never submitted…etc. The idea here is that you’re able to target visitors dependent on the particular portions of your site they visited or action they performed. The flexibility lets you determine to whom your remarketing ads will show. 2. Your Remarketing Tag – Once you’ve selected the audience you want to remarket to, you’ll use your Google adwords tool to include the tag on every page of your website. To begin building the tag, follow these instructions. Click shared library on the left side of the screen. Since this is your first time setting up a remarketing campaign you will see this screen that begins on the process. Once you’ve clicked “Set up remarketing,” you’ll then be given your remarketing tag that you’ll install on every page of your site. 3. Set up your targeted lists – You can create as many lists as you’d like. While still remaining under shared library you’ll select audiences. Keep in mind you will need to define your campaign types to set. It’s important to note that if you have a different campaign type you won’t be able to create a remarketing list but you can change your campaign type at any time. From there select the new audience drop-down and select Remarketing list. You’ll then have the ability to choose from two options. Define a list of visitors based on site specific URLS. (You’ll select this if you’ve already placed a remarketing tag on your website. Or, define a list of visitors by placing a new tag on your site. Once you’ve performed these steps you’ll want to define how long the remarketing campaign will last (Google sets the default at 30 days). We recommend 60 days and then select the size of your list. List size can be broken down to include either past visitors that match your list, or you can start with an empty list and have the ads go out to all future visitors. Here are some additional tips that you can use for effective remarketing campaigns. 1. Define more specific lists by using AND/OR conditions – This means that you can define a list using more than one keyword in the URL, say for instance “bicycle,” and “helmet.” This way the remarketing cookie will apply to anyone who’s visited a page that contains both “bicycle” and “helmet” in it. 2. Set frequency caps – You don’t want to annoy your potential customers with you ads. Setting Frequency caps make it so that your ads don’t appear everywhere your customer goes on the Internet. You can set frequency caps by the day, and by the ad group (type of ad.) Frequency caps help prevent you from appearing like a total internet stalker. 3. Create exclusive offers - Part of the allure of remarketing is that you’re able to display an ad to someone who showed some interest in your product or service. Since you’re able to control the duration of the ads, and whom they’re being shown to, you can entice people to come back by offering “deals,” on your products or service. 4. Emphasize why you’re the company they need to solve their problem – The fact is that if a site visitor left your site without making a purchase, the odds are still high that they haven’t bought from anyone else either. PPC advertisers often neglect to reinforce the idea that there is a clear-cut choice when making a purchase. Inside your ad make sure to promote your USP and watch the sales increase. Tip: Make sure that the keyword of the ad matches the page they land on. Disparities will result in higher bounce rates. 5. Create custom ads – Remarketing essentially continues a conversation that the prospect left in the middle of If it was the case that someone added the vitamins you sell to a shopping cart and then never completed the transaction, continue where the conversation left off. In your ad talk about the product that they almost bought, and provide a call to action that will bring them back in the fold to buy your product. This can be done with unique calls to action and exclusive offers. 6. Don’t be boring – Like I just mentioned, remarketing is the continuation of a conversation, so speak to the prospect directly. Don’t just flash an ad with your logo and company name. Invite them back and treat them like you would a person you’re sincerely interested in doing business with. Begin Remarketing Today To Bring In More Leads For Your Mortgage Company. As you can see, remarketing isn’t difficult to implement and is a smart way to lower PPC costs and bring in customers who are interested in your mortgage products or service. If you’d like to learn more about lead generation, including remarketing download our FREE E-BOOK! Do you plan on adding remarketing to your lead generation quiver soon? If so, do you have any questions you’d like answered about how we use remarketing to generate leads. Please let us know in the comments below.